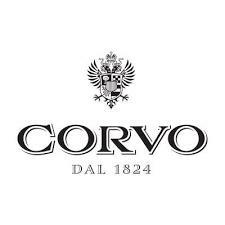 Corvo is a celebrated Sicilian wine produced in Casteldaccia, near Palermo. The name derives from a legend that a boistrous crow ("corvo" in Italian) was pestering the vineyard workers. A local monk who was said to have the ability to talk to animals took the crow to a cave where they negotiated an agreement: the crow would stay silent if his symbol would be used for the wine. Hence, the name and the black crow on the label. For many years, Corvo was one of the only table wines imported from Sicily. While that is no longer the case, it is still a popular brand. The signature rosso and bianco blends are expressions of the region's starring varietals. For rosso: Nero d'Avola, Nerello Mascalese and Pignatello (Perricone). For bianco: Inzolia and Grecanico. The winery also produces other reds, whites and a grappa. Made from a blend of native grapes Insolia and Grecanico, this is a light-bodied but refreshing wine that recalls lemon zest, peach and green apple. Fresh acidity gives it a clean, bright finish.